Welcome to Shangri-La! AC & Walk to Keyes Beach! 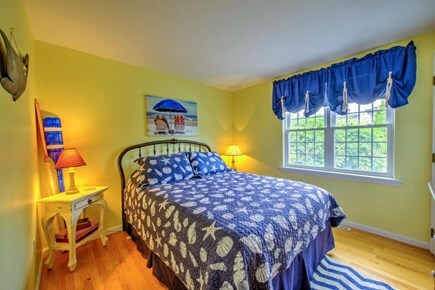 Our beach house vacation home can be your relaxing home away from home! No need to load the car with your beach items. Keyes Beach is less than a 10 minute walk from the house. When you return, you can take a wonderful outdoor shower or relax on our comfortable patio furniture. Our home has outstanding outdoor living with one large deck and a smaller side deck of the side of the house. A beautiful fenced in yard is also available for playing or lounging. 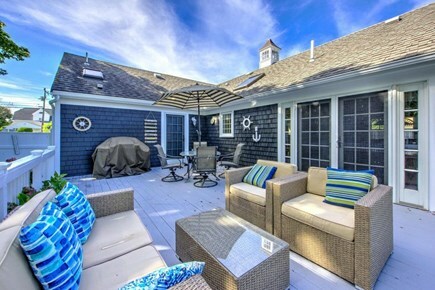 Feel free to BBQ on the over sized deck or take a quick bike ride to all of the great restaurants and shops on Main Street,Hyannis. There is also an additional family room with large screen TV in the basement. Chilly night? Light up the gas fireplace. 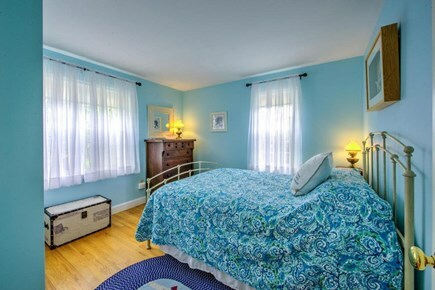 In addition to central AC, amenities include a dishwasher, washer/dryer, cable TV, and Internet. Additional pricing info: Cleaning fee is $150.00 per stay, State and local taxes of 14.45% will apply. What a pleasure to spend a week here with my whole family!!! This is really a big house so sleeping all 8 of us was a pleasure. Finished downstairs was great for my grand kids as they enjoyed watching their favorite shows on the big TV. Short walk to a beautiful beach and a wonderful outdoor shower to clean up after beaching all day. The hot tub was a big hit for even the young ones. I can't say enough about this place. Short distance to Main Street was also a plus. You can actually walk there if so inclined, but with all the little ones we drove up and parked. So convenient. The yard was also so private that you don't even know there are houses nearby. Beautiful grounds and a great location. Would definitely recommend this place. My family and I (party of eight) stayed at this wonderful home that is just minutes away from the beach. 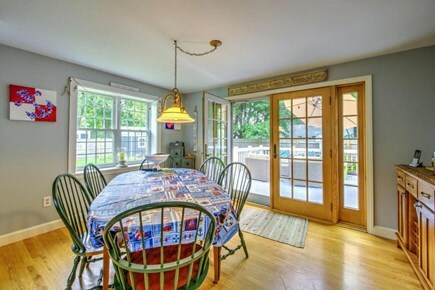 The home is extremely clean and has all the amenities for a perfect stay. The deck and the spa were a wonderful touch. The home is very cozy and accommodated us perfectly. 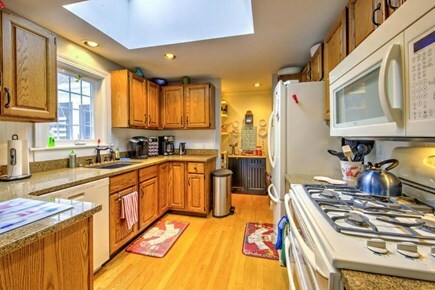 The owners of this home make sure nothing is missing in this home. We definitely recommend this lovely home and we hope to stay here again! Perfect Family Week on the Cape! My family stayed here for a week and would do it again. This home and landscaping are beautiful and the location was perfect. The outdoor space is amazing. (We ate dinners on the deck, played cards with family, coffee in the morning/drinks at night, and using the Hot Tub when the sun went down.) The indoor space was perfect (Very clean, "Cape feel," great master bedroom, plenty of space, and having a brand new washer / dryer was great too)! Great house with 2 Decks! This house is charming and has the perfect layout. There are two decks. The larger one is ideal for entertaining, grilling and eating, and the other deck (smaller) was my getaway deck which has a jacuzzi off of it. The house has beautiful landscaping and the yard feels bigger than it is. 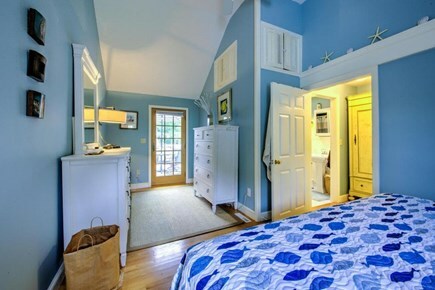 The house had three bedrooms on the main level which was perfect with two bathrooms, one being off the master. We really enjoyed grilling almost every night and taking time to relax on the deck. It was really peaceful looking out at the beautiful landscaping. 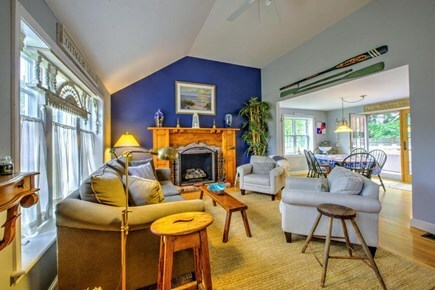 Great central location and a short walk to Keyes Beach which was perfect for my elderly parents who joined us. 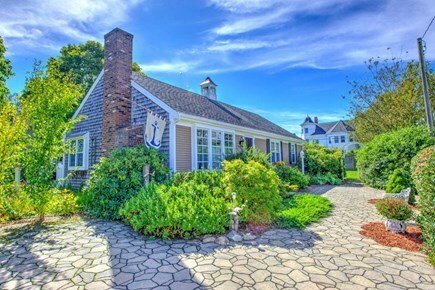 Main St. Hyannis is a bit of a tourist trap; if you want more of a quintessential Cape experience go to downtown Osterville. My wife and I had one date night and we went to the Ocean House in Dennisport which was really nice -- just make reservations in advance! Other great things to note: No keys to worry about. You just punch in a code. They have really nice beach chairs, buckets, and even umbrellas you can use. The big umbrella on the large deck is spectacular when sitting on their nice furniture. The jacuzzi is high end with lights and lots of jets, nice indoor sitting area next to the master bedroom, ample towels, cooking tools, all the seasonings, plates, plenty of toiletries, etc...There is also a nice lower level which has a king bed and a nice sitting area with a trundle bed. It also has an ongoing dehumidifier so it smells good for a basement level room. The name of the rental says it all. It was perfect for our family and in-laws. We could not have been happier with the property. Its quiet but close location to main street and the beach were great. We will be back! Such a beautiful home. 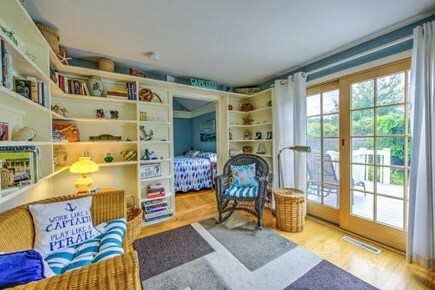 Each room has its own unique design. The outdoor patio was very inviting and was great to have your morning coffee on. We spent much time enjoying the beautiful landscaped yard while relaxing on the deck. Location, location.... within walking distance to downtown where there are many restaurants and stores. And the beach was just down the street. I highly recommend this home. I know I’ll be back. What a great home and area! What a fun weekend we had at this beautiful home! I loved that the house was close to the center of town. We shopped and dined there, then went back and jumped in the hot tub. The next morning we sat by the fireplace with our coffee. We checked out the beach, a short walk away, and we will definitely be back in warm weather to lounge and swim. 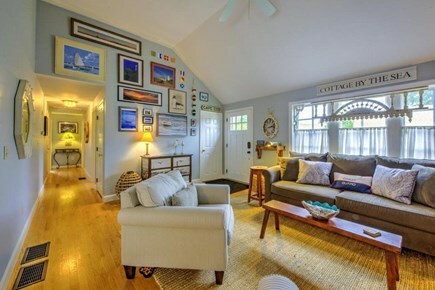 Picture perfect rental. Ideal location. Homeowners made our stay so comfortable. Beautiful home and best location for summer fun. I will definitely return! My husband and I have always wanted a house within walking distance to a beach. The first time we saw this house - we know it was perfect. The landscaping, outside decks, hot tub are perfect for just relaxing and getting away from it all. I love taking an early morning stroll to the beach when it's peaceful and quiet! 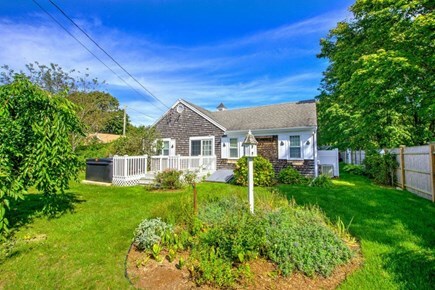 The house has a wonderful coastal feel to it with great outdoor living space and a quick walk to the beach and downtown Hyannis. Also love the gas fireplace and central air! 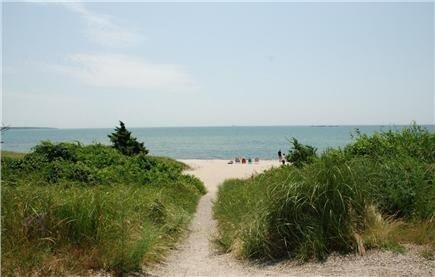 Hyannis has everything a vacationer could possibly ask for - great restaurants, shopping, ferry to the islands, beaches.